Thursday night at Jarboe Park a news reporter, Greg, visited the courts to interview and take pictures for the Atlantic Beach Life magazine. The magazine is distributed to approximately 5000 customers. After taking pictures and talking to several of the players, Greg accepted the challenge of learning the game. Hopefully, he will return to the courts to enjoy the fun of our group and the game. Greg will let us know when the article will appear. 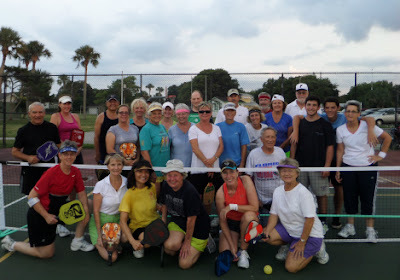 Today Pickleball by the Sea volunteers conducted a clinic for the residents of Fleet Landing. Their courts have been resurfaced and pickleball courts have been established along with tennis lines. 30+ people attending the clinic with another dozen sitting on the sidelines encouraging all to have fun learning the great game. Many of the players became “pickled”. We are seeking funding and or donations to purchase wind screens for the courts. The City of Neptune Beach will allow a company to place their 3’x5’ business logo on a screen for the purpose of letting all know they support Pickleball. We have researched the cost of screening. A Texas company has offered a $250.00 charge for 120’, with free shipping. In addition, there is a possibility of several used screens being donated towards the end of the year by a local country club. Either way, the wind screens would certainly enhance the game. If you know of a company/business you could solicit for funding in exchange for the placement of a windscreen, please let us know. The Senior Games (50+ ages) will begin at the end of September. Pickleball will be played indoors at Cuba Hunter Park in Jacksonville. Competition will begin Oct 2nd-Singles, October 3rd-Doubles, and Oct 4th Mixed Doubles. I will be visiting the Jacksonville Beach area for a week beginning Sunday, February 15 through Friday, February 20. Any chance there might be pick-up pickleball for someone visiting from out of town in that general area?